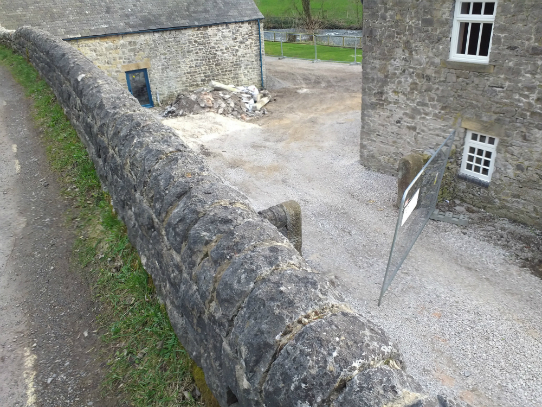 CHANGES TO SEVERAL properties in Monsal Dale have taken place since the most recent organised Mad Dog location trip was held. The lean-to roof extension at Upperdale House (which was replaced in 2016 after falling into a state of disrepair for several years) has recently been removed as part of an extension programme of renovation currently underway at that property. 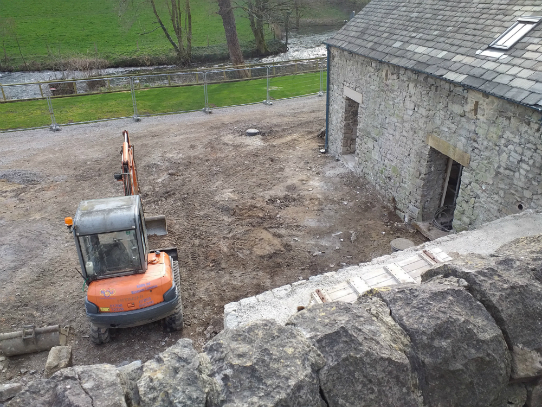 The barn is being upgraded to provide additional holiday accommodation on the site. This change means that this particular Mad Dog filming location, visited during many organised location trips since 1999, has effectively 'gone away'. 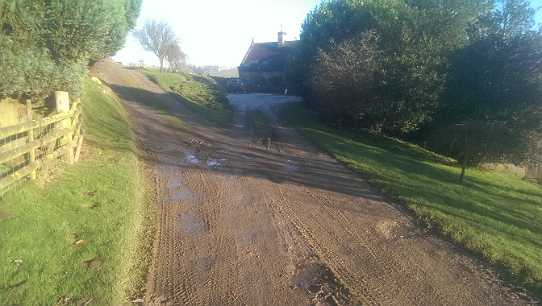 The Upperdale House and Riversdale Farm properties are now both being managed directly by the Chatsworth Estate, and a newly installed driveway, runnning to the rear of Upperdale House, once completed, will connect both residences as a single entity. 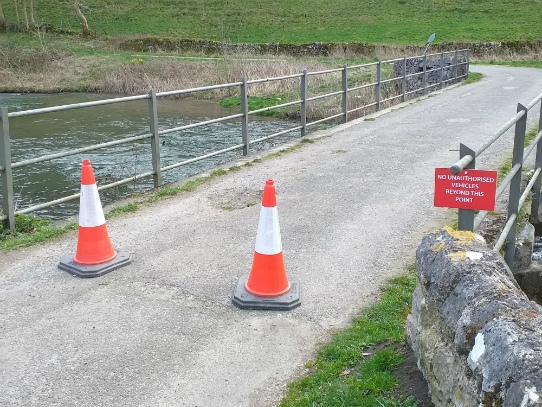 In response to concerns about the load-bearing capacity of the road bridge (which is not a through route to any destination), traffic cones have been placed on the main road side of the bridge to disuade 'casual' traffic from attempting to cross. The riverbank adjacent to the grounds of Upperdale House had become significantly overgrown in recent years. The area has now been cleared and a new fence added to discourage access to the river through this route. 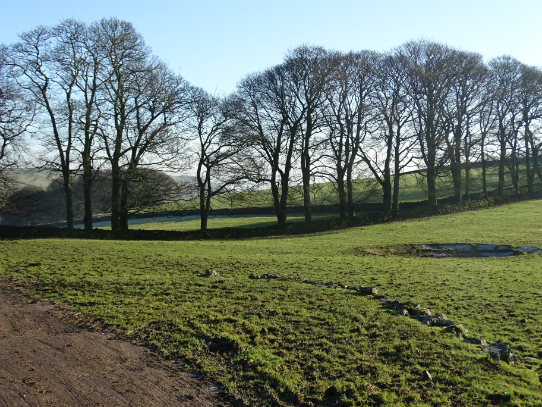 The field between the Dean Cottage double-garage and the derelict stone barn is now being used to house livestock. This has required new wooden fencing to be erected along the field edge adjacent to each of these buildings. 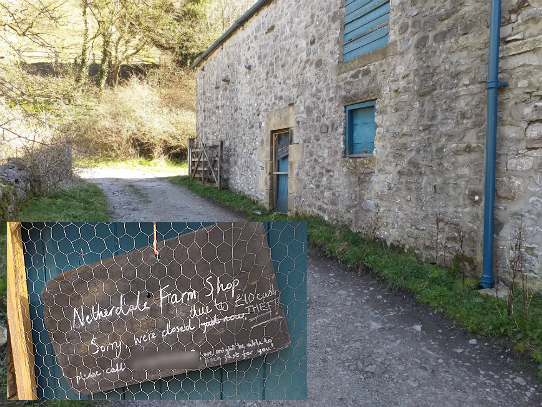 The barn at Netherdale Farm had recently been adapted to support a farm shop, accessed through the door the opens on to the public footpath. However, following an 'honesty box' theft the shop has been closed - to drop-in visitors at least. 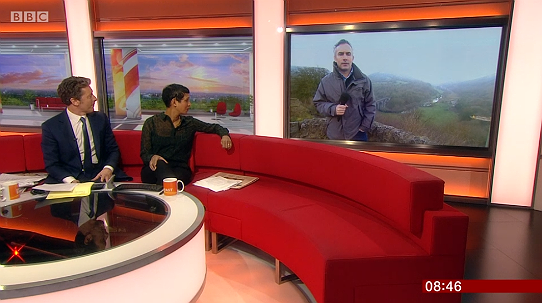 MONSAL HEAD AND the view out over Monsal Dale appeared on early morning television on Friday 11 January, as BBC Breakfast live broadcast from the scene for a feature about the future of Britain's National Parks, more than seventy years after the first such park was established. 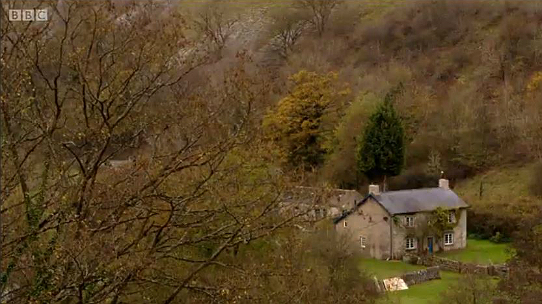 The Monsal area (the principal filming location for Mad Dog) was pictured in a series of short reports throughout the morning broadcast, with reporter Tim Muffett first appearing inside the Monsal Head Hotel (sensibly hunkered down near the roaring wood burner), before appearing on-screen in the grounds of the hotel, and then finally, as the morning light broke through, interviewing his guests with the view of Monsal Dale behind him. The feature was an update on a review of future options for the management of the country's National Park and Areas of Outstanding Natural Beauty, which the government launched in May 2018 and which continues to collate evidence. "Our protected landscapes are England's finest gems and we owe a huge debt to past generations who had the wisdom to preserve them." "The system they created has been a strength, but it faces challenges too. It is an honour to be asked to find ways to secure them for the future. I can't wait to get started and learn from everyone who shares an interest in making England's landscapes beautiful, diverse and successful." 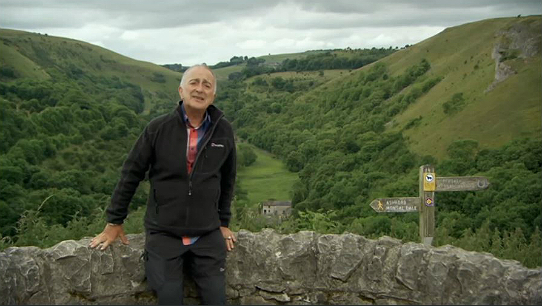 TV CAMERAS WERE back in Monsal Dale again recently, this time to record part of a two-wheel tour of the Peak District by Larry and George Lamb. 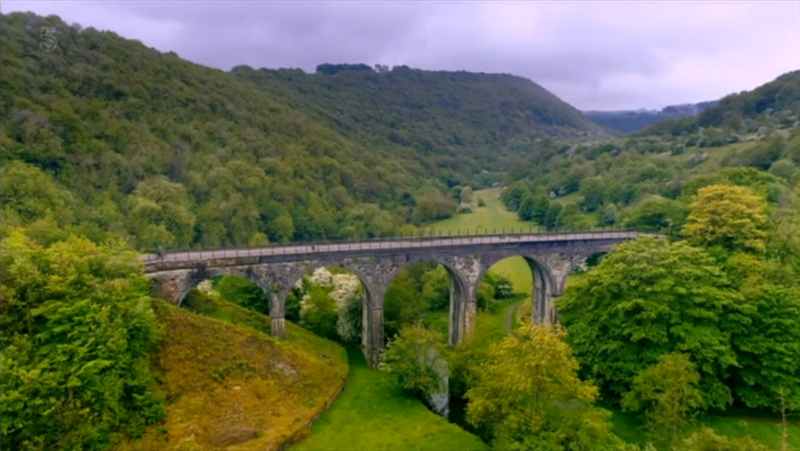 Episode three of the second series of Britain by Bike with Larry & George Lamb (first shown on Channel 5 in the UK on 31 August 2018) showed the father and son cycling along the Monsal Trail out of Bakewell, through the Headstock Tunnel and out across the Monsal viaduct. 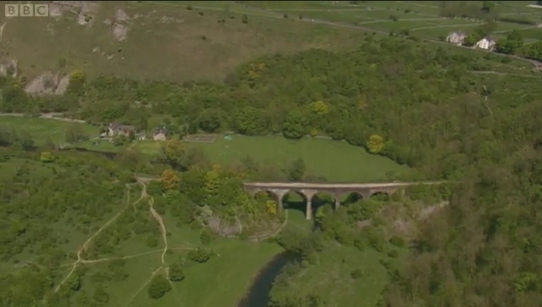 In 1977, the Monsal valley was one of the principal filming locations for the third series Survivors episode Mad Dog. 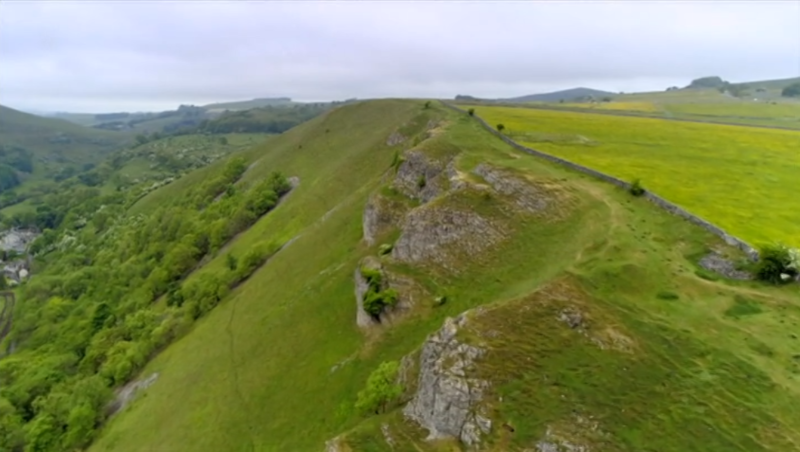 'The Peak District' episode of Britain by Bike is available to stream from the My5 web site (until 15 July 2019), and was screened again on 12 January 2019. 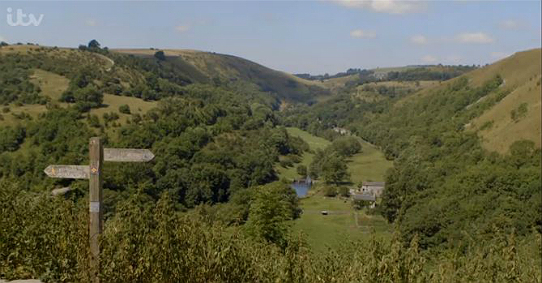 BBC CAMERAS RECENTLY returned to the Monsal valley in the Derbyshire Peak District, one of the principal filming locations used for Mad Dog, to record an episode of Mortimer and Whitehouse: Gone Fishing. 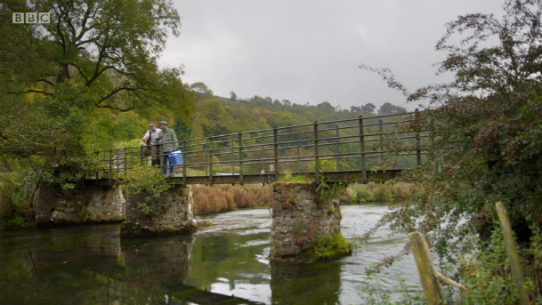 First shown on BBC Two at 22:00 on 4 July 2018, the third episode of the first series, "Rainbow Trout - Derbyshire Wye", showed the pair fishing at locations throughout the valley, and included aerial shots of the area's key landmarks, including its bridges, the viaduct and the weir. 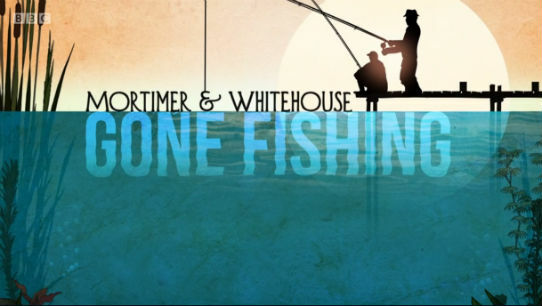 The show explores the efforts of comedians Bob Mortimer and Paul Whitehouse to catch a variety of fish (Whitehouse is an accomplished fisherman, Mortimer is not), with the pair's reflections on the challenges of ageing and their work in the entertainment industry. Both of them have had to deal with serious and acute heart conditions, which have forced them to introduce significant lifestyle changes, and which have made them more aware of their own mortality. Their conversations are witty, self-deprecating and often insightful, and there's some terrific, gentle comedy to be found in their interactions and in Mortimer's attempts to compensate for his lack of fishing prowess with his interesting culinary skills. The episode was made available (in the UK) on the BBC iPlayer for thirty days after transmission. 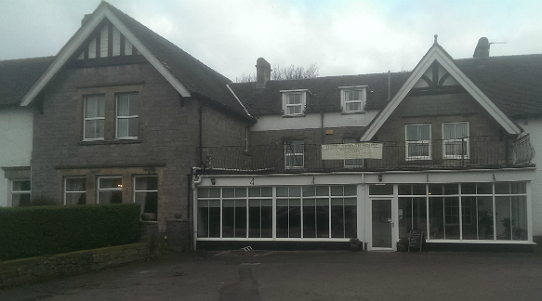 DURING THE ORIGINAL location filming for Mad Dog at Ilam and at Monsal Dale, cast and crew stayed at The New Inn, Alsop-en-le-Dale, arriving in the afternoon of 27 January 1977. At the time of the BBC's visit, the hotel was in need of some significant renovation. Director Tristan de Vere Cole recalls "staying in this little broken down hotel in the snow, at Alsop-en-le-Dale." A place that was a "little ragged around the edges", but "a place of real character" and itself "perfect for a location." 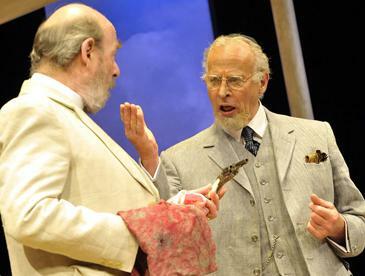 During the first night, de Vere Cole attempted to comfort the newly-widowed Bernard Kay (Sanders) who was determined to continue working on the production despite his recent bereavement. "So we stayed up when he'd arrived that first night at the hotel, until three o'clock, playing backgammon. Come the following morning, "he did his job," the director adds, "he was so professional." De Vere Cole also recalls that actor Ralph Arliss (Sanders' companion Jim) "got up before shooting and did a sort of marathon run every morning." Morris Perry (Dr Richard Fenton) also has clear memories of his time at The New Inn. He says that it was always "good to get back to the hotel, where I remember low rafters and real blazing fires." It was a cosiness that proved irresistible to fellow cast member Stephen Bill (Ron). "I had bought a Commer Camper Van and this seemed the ideal opportunity to sleep in it and save money on my expenses," he recalled later. "In the event I drove from London to a very icy Derbyshire, met up with everyone in a very cosy country hotel and immediately booked myself in!" 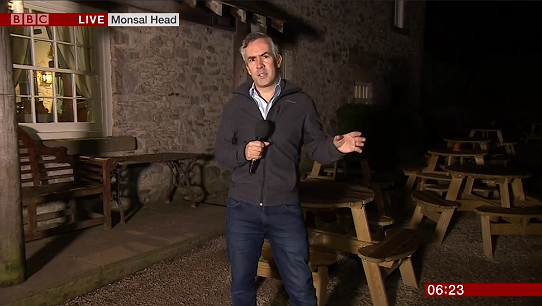 Since the production of Mad Dog, The New Inn at Alsop-en-le-Dale has been completely renovated and renamed as Newton House (Peak Distict Hotel & Tea Rooms). A recent visit to Ilam provided the ideal opportunity to call by for a brief photo stop outside the premises. 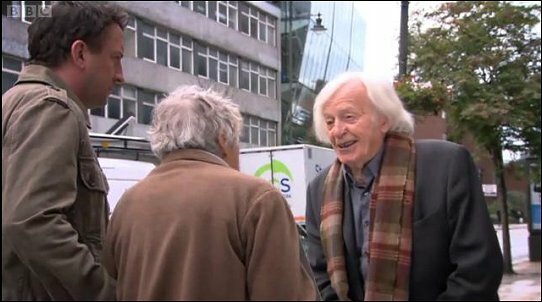 MAD DOG GUEST star Morris Perry appears in a recent Big Finish podcast, recorded in June 2016, at the age of 89. 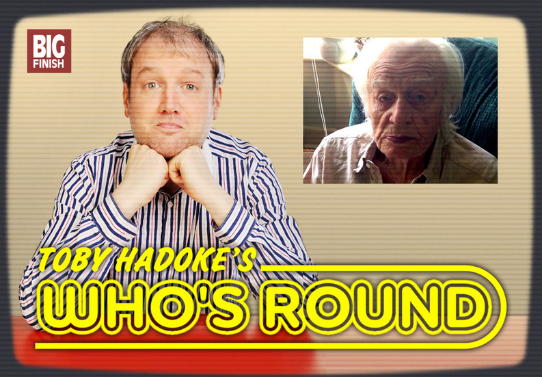 Episode 177 of Toby Hadoke's Who's Round interviews Perry about his work on Doctor Who and, in the process, learns much more about many different aspects of his long and varied career. Recorded shortly before his 90th birthday, there are attempts to bring the conversation back to Doctor Who but as you can imagine, there's quite a lot of life and work that is probably a bit more memorable for this illustrious Pertwee era villain. He's the kind of chap who is, at 89, learning Latin and Ancient Greek in his spare time: and so as you can imagine, is a fascinating fellow whose career has seen him play King Lear via stints in The Sweeney and Secret Army, and who is still working today. Morris Perry, in Tony Hadoke's Who's Round. 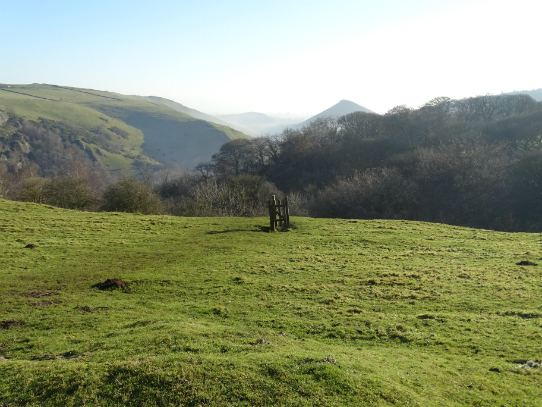 One of our circular walks from the hotel traced a route along Dovedale, before ascending the side of the valley into Dovedale Wood and passing both Air Cottage and Ilam Tops Farm; filming locations used on the shoot for the episode, 40 years ago this month. De Vere's production unit arrived in Ilam on 28 January 1977. 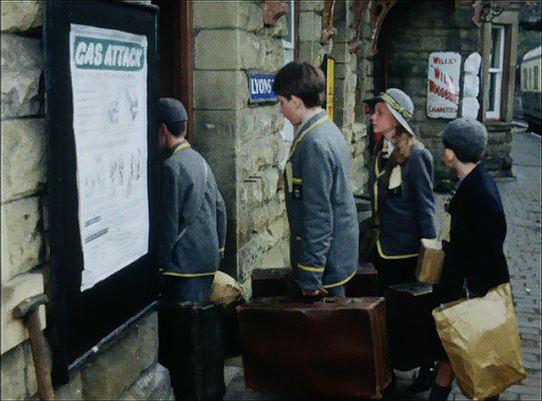 NEWLY RELEASED ON DVD, the original five-part 1974 BBC TV adaptation of children's wartime evacuation drama Carrie's War shares two filming locations with Survivors. 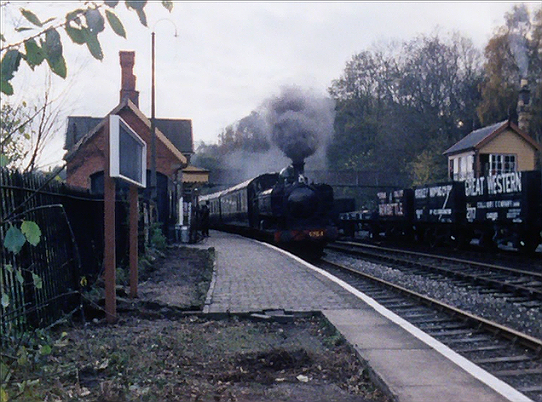 In episode one, the children evacuated from the terrors of the London Blitz by train are shown steaming through one railway station (Hampton Loade, on the Severn Valley Railway - the setting for the closing scenes of Mad Dog); before arriving at their destination at a second (Highley Station, the location for the opening and finale of Bridgehead). 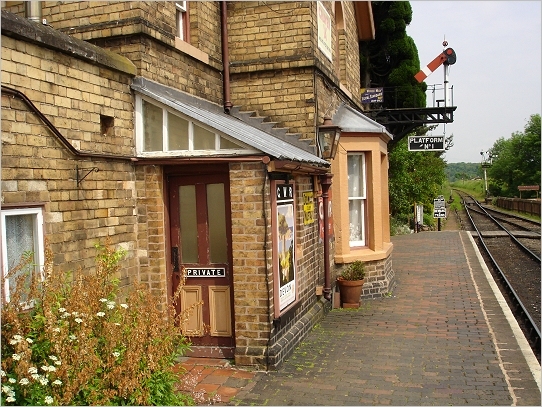 Highley station is also seen in the fifth and closing episode of Carrie's War when the children begin their return journey to London. 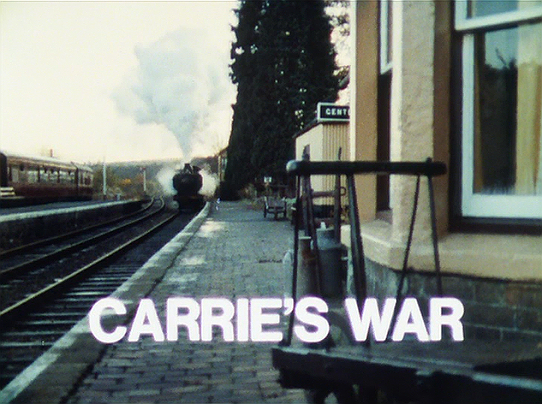 Adapted from Nina Bawden's 1973 novel of the same name by scriptwriter Marilyn Fox, Carrie's War tells of the experiences of Carrie, her younger brother Nick, and a group of inner-city children who must accustom themselves to the very different life and culture that they encounter in a small Welsh village. In the process, the young arrivals attempt to resolve a long and bitter family feud. Starring Juliet Waley (Carrie Willow) and Andrew Tinney (Nick Willow), and directed by Paul Stone, the series was shot on film and entirely on location (with many of the settings provided in and around the village of Blaengarw). The first episode was shown on BBC 1 on 28 January 1974. Released in November 2015 by Spirit Entertainment Limited, Carrie's War is available on DVD from Amazon and most other online retailers. The series was remade by the BBC almost thirty years later. The remake was released on DVD by Acorn Media in 2004. 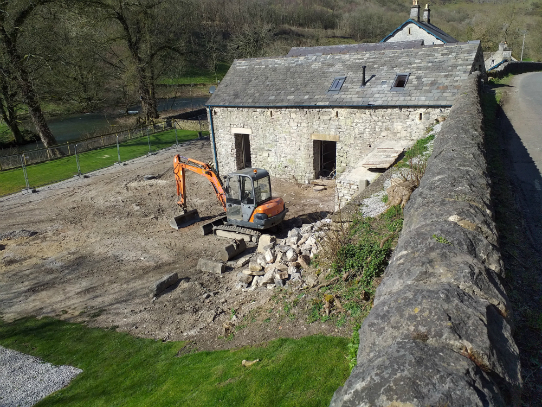 THE WORK TO repair the lean-to barn roof at Upperdale House, Monsal Dale (used as a filming location in Mad Dog) - which began in the summer of 2015 - has now been completed. 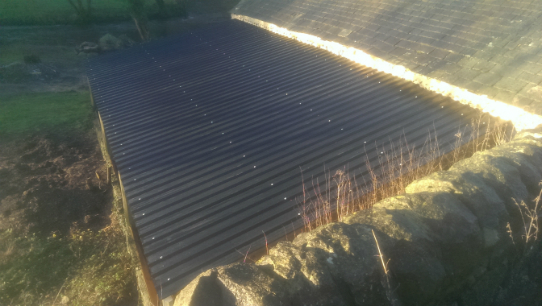 New and lightweight corrugated roofing panels have been bolted on top of the new wooden frame; replacing the old slate tile and beam structure. The lean-to has been in a near-collapsed state for a number of years; and has been reinstated as part of a continuing programme of renovations at the premises. 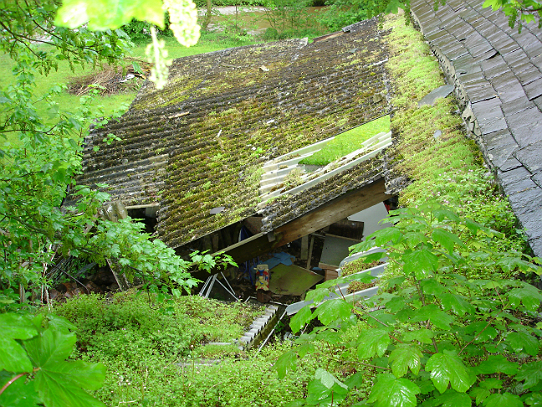 THE LEAN-TO BARN roof at Upperdale House, Monsal Dale - used as a filming location in Mad Dog - is being repaired and renovated, after falling into a state of complete disrepair. 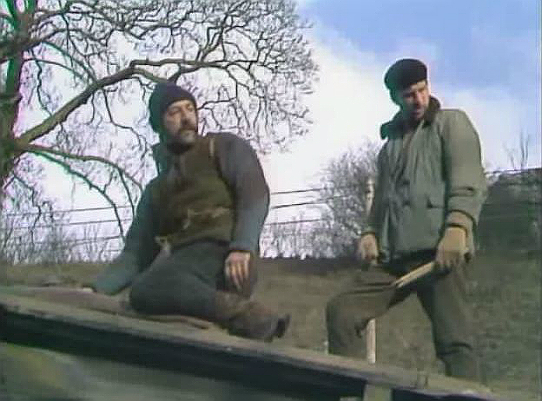 In Mad Dog, the barn features as the setting for the first meeting between Charles and Sanders and Jim (who, co-incidentally, are depicted as carrying out repairs to the roof at the time of Charles' arrival). 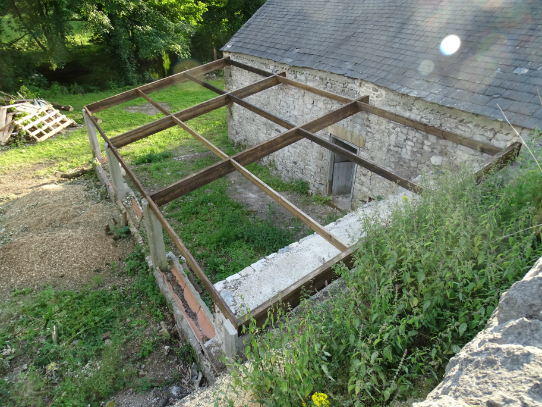 The lean-to has been in a near-collapsed state for several years; and is now being reinstated as part of a programme of renovations at the premises. 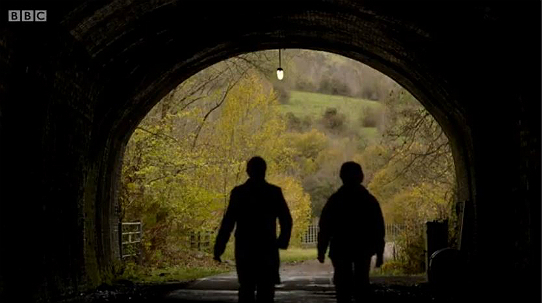 MONSAL DALE FEATURES in the first episode of a new ITV series Richard Wilson on the Road, in which the acclaimed British actor retraces the tourist routes documented for car drivers in the famous 1930s Shell Guides. In episode one, Wilson tours drives through the Derbyshire Dales, learning about the famous Kinder Scout trespass, and calls in at Monsal Head to take in one of the best-known views in the district. The episode is viewable on the ITV Player until mid-February 2015. BERNARD KAY (WHO memorably played the role of Sanders in Mad Dog) has died at the age of 86. Kay was found deceased at his home on 29 December 2014, though details of his passing were only made public on New Year's Day 2015. In 1977, Kay arrived on location in Derbyshire to record his role in Mad Dog only days after the death of his wife Patricia Haines, who passed away aged 45. Mad Dog director Tristan de Vere Cole later recalled: "She had literally just died the week before shooting. And he arrived... and I had said to him 'look Bernard, we can leave your scenes.' He said 'no, no - I want to work.' So we stayed up, when he'd arrived that first night at the hotel, until three o'clock playing backgammon." Come the next morning: "he did his job, he was so professional." Kay enjoyed a long and varied career on the small screen, in film and on stage. On TV, he appeared in Z Cars, Doctor Who, The Professionals, Coronation Street and Foyle's War amongst many other productions. Toby Hadoke recalls of Kay's work: "He was one of those superb understated but versatile actors that we don't seem to have any more. He never gave a bad performance. He was greatly admired by his peers. His sense of humour was combative but there wasn't any meanness in him." News of Kay's passing appeared in The Mirror, Manchester Evening News, The Courier and The Daily Mail. In Sherwood Forest and the Peak District, Tony Robinson explores the story of King John, the hapless monarch who stumbled from one crisis to another. 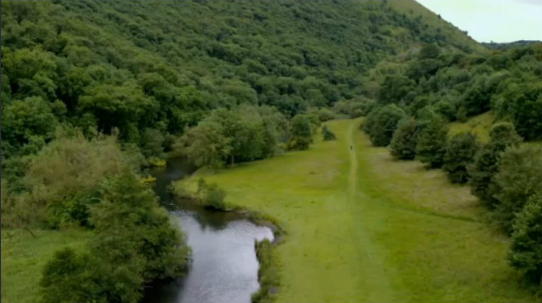 'King John's Ruin: Peak District' can be viewed on the 4OD service for four weeks following its original transmission on Channel 4 in late November 2014. You can download a free walking guide and map which will allow you to trace Tony Robinson's illuminating journey through the troubled history of King John. 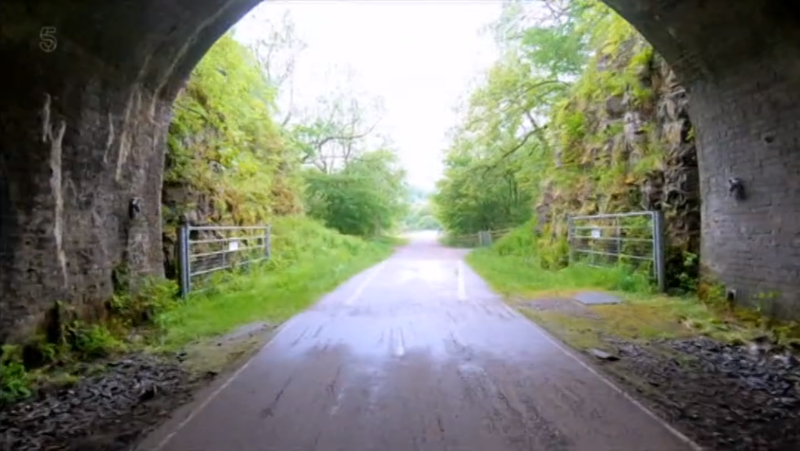 A REPEAT SCREENING of the Tales from the National Parks documentary series featured some work-in-progress footage from the project to re-open all of the rail tunnels on the Monsal Trail, including the Headstock tunnel at Monsal Dale. 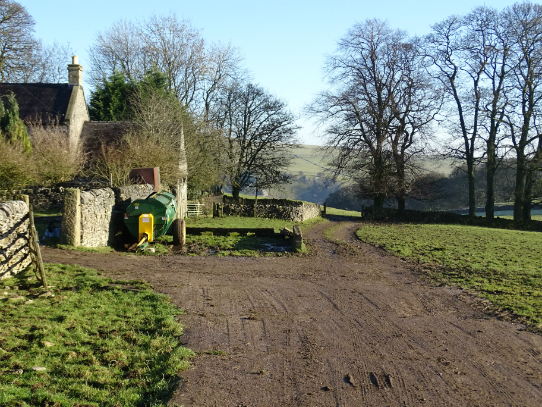 A war is breaking out in the charming villages of the Peak District, with walkers, horseriders and residents angry at 4x4 drivers and trailbikers motoring up and down the green lanes for pleasure. So an 80-year-old retired primary school teacher decides to launch a campaign to get the motorists banned from a lane in her village of Great Longstone. Over the next few months the campaign snowballs and more and more villages decide they've had enough of the off-roaders on their lanes. 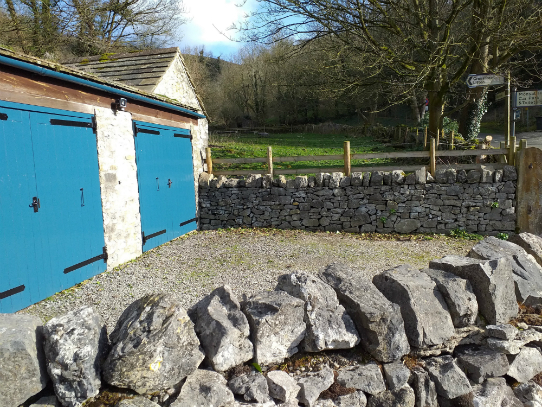 The project to re-open the entire of the Monsal Trail to walkers, horse-riders and cylists was introduced in the programme as an example of a development intended to meet the requirements of a range of different (non-motorised) park users. 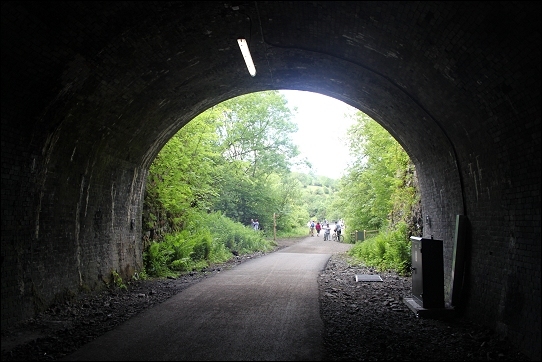 The 8.5m long Monsal Trail opened in the summer of 2011, and a wealth of information about accessing and enjoying the trail is provided by the Peak District National Park Authority. 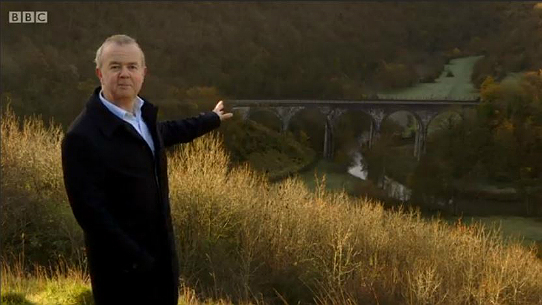 Originally broadcast in October 2011, Tales from the National Parks enjoyed a repeat showing on BBC Four in August 2014. 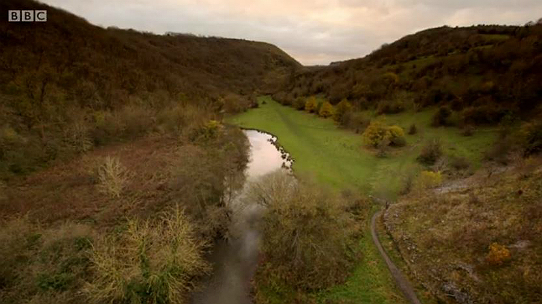 THE LANDSCAPE OF Monsal Dale features extenisvely in the recent BBC documentary Ian Hislop's Olden Days, a three-part series "exploring our deep-seated obsession with the past." To conclude the series, Ian reflects on the irony that some of our most cherished olden days' landmarks were once reviled. 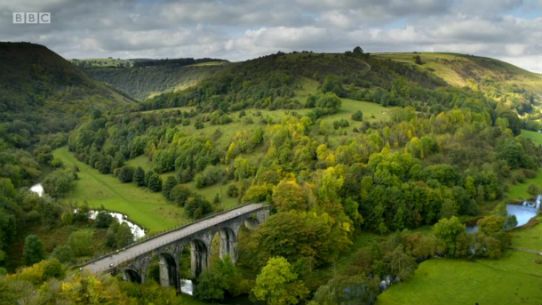 Victorian conservationist and critic John Ruskin led a national campaign to halt the construction of the Headstone Viaduct in Monsal Dale which he claimed entirely defiled the timeless landscape. Now it's one of the highlights of a visit to the Peak District. Ian Hislop's Olden Days is not currently available on the BBC iPlayer, but repeat screenings of all three episodes of the series may follow. MAD DOG STAR Denis Lill is appearing in a touring production of Agatha Christie's 1944 crime mystery Murder on the Nile. Presented by the official Agatha Christie Theatre Company and starring Kate O'Mara (Dynasty, Bad Girls), Denis Lill, Susie Amy, (71 Degrees North and Footballer's Wives, Chloe Newsome, (Coronation Street), Ben Nealon (Soldier Soldier) and 1960s pop star, Mark Wynter. Denis Lill (Canon Pennefather) who, in a fantastic solo scene finally acts out and discovers the murderer) has the most natural movements possible onstage, every action flowing, every gesture arriving to fit script and emotion as one. A rare talent indeed and a pleasure to watch for that alone. 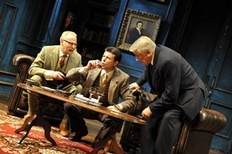 The production, managed by theatrical producers Bill Kenwright Ltd, and through special arrangement with Agatha Christie Ltd, is the seventh in an ongoing series of stage presentations of Christie's work by the company's ensemble. 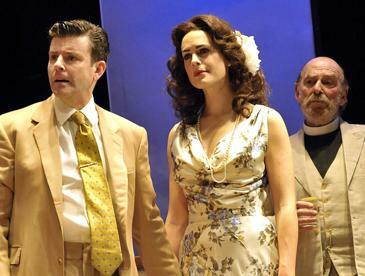 Murder on the Nile began its tour in early January 2012 continues at venues across the country, concluding at the Arts Theatre, Cambridge in August 2012. 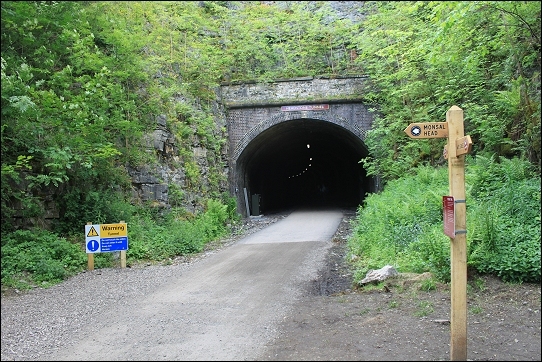 WORK TO OPEN up all the previously closed railtunnels on the Monsal Trail (including the Headstone Tunnel seen in Mad Dog) has now been completed. 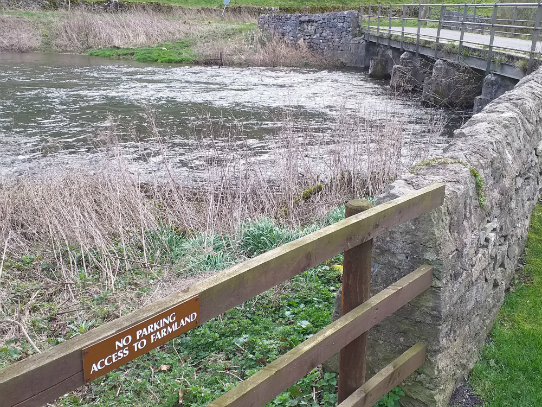 This means that it is now possible to walk, cycle or horseride the entire length of the trail - from its beginning, adjacent to the train station in the village of Bakewell, to its conclusion, at Blackwell Mill at Chee Dale. 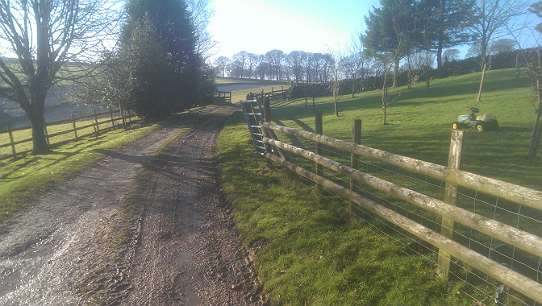 Work to open up the trail was undertaken by the Peak District National Park Authority, with a budget of £2.25 million provided by the Department of Transport. 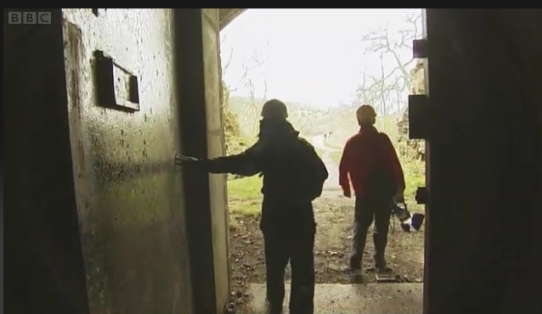 The tunnels have been repaired and made safe, the huge locked steel doors removed, the trail resurfaced and all of the tunnels provided with electric light. 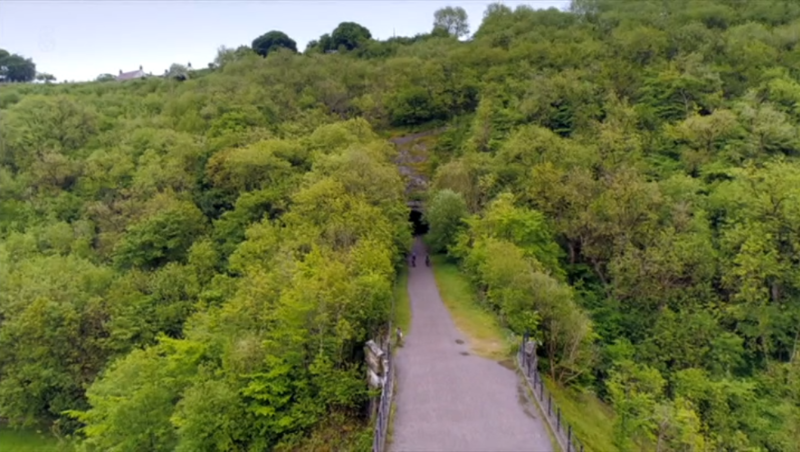 Following the closure of the line in 1968, all of the tunnels on the line had were sealed, and, until now, the Monsal Trail had to divert around each of the tunnel sections in turn. At the time of the filming of Mad Dog in 1977, all of the tunnels were still open, and the mouth of the Headstone tunnel was seen extensively on screen during Charles and Fenton's early discussion on top of the viaduct. When the dog pack arrives, drawn by scent of roasted rabbit, one half of the pack approaches from along the viaduct, while the other emerges from the stalactite-rich tunnel. MAD DOG STAR Denis Lill was guest of honour at the 2011 Montacute Church fair in Somerset on 11 June. Lill opened proceedings and took the time to get into the spirit of things by joining in the performance of local Morris Dancers (see photo below). All eyes were back on Denis Lill as he crowned the Montacute Carnival prince and princess ahead of next weekend's parade. Caroline Lewars, one of the organising committee, invited Mr Lill as a family friend. She said: "He's an old friend from when we both lived in East Chinnock. "His wife and I used to co-chair the playgroup and we've kept in touch. "When we were thinking about someone who could come along and open the fête for us, I thought of him and it was very nice of him to agree." 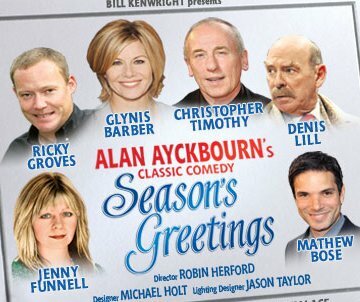 IN THE AUTUMN, Lill returns to the theatre to appear in a touring production of Alan Ayckbourn's popular Xmas-time comedy Season's Greetings. The production, which also features Glynis Barber (Soolin, Blake's 7) and Christopher Timothy (All Creatures Great and Small), begins its run at the Theatre Royal, Norwich on 12 September 2011 and concludes on 10 December at the Theatre Royal, Bath. The production is brought to the stage by Bill Kenwright Ltd, the same company responsible for Lill's recent Agatha Christie productions, including Witness for the Prosecution, Spider's Web and And Then There Were None. ROBERT PUGH (TERRY, in Mad Dog) appeared in the stylish BBC One seven-part thriller The Shadow Line, which starred Christopher Eccleston, in May-June 2011. Pugh played the role of the doomed drugs baron Bob Harris. Denis Lill (Charles) appears in the final series of nostalgic hospital drama The Royal (ITV 1), which begans its last run in June 2011, in the returning, recurring role of Mr Rose. 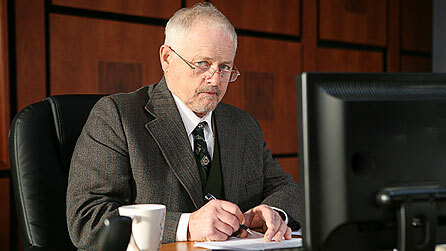 ROBERT PUGH (TERRY in Mad Dog) takes the lead role in new BBC daytime legal drama Justice. Set in the Dovefield Public Justice Centre in Liverpool a "one-stop shop for crime and punishment" Pugh plays the role Judge Paddy Coburn, a passionate but flawed advocate for justice. "On one level he's very together, as he has to be for a Judge - knowing the law and having experience of the law. He's been around and travelled quite a bit. In another sense, he's all over the place emotionally. This is because of his past which creeps up on him like a tsunami. He's a paradox of himself, and that's what makes him interesting as a character. What drives him is the tremendous amount of guilt he has and that is what has brought him back to the city. He's trying to sort it out because he's not a happy man. He has made a decision that until everything in his past is resolved, he isn't going to be happy." Justice begins on BBC One daytime on 4 April 2011. MORRIS PERRY (RICHARD Fenton in Mad Dog) appeared in a brief supporting role in the Fireworks episode of series four of BBC One situation comedy Not Going Out on 3 February 2011. Perry played the role of Stan, a pensioner friend of the aged guest character Betty (Vilma Hollingbery), "an old lady [who] wanders into Lucy's flat and makes herself at home on the sofa." With Daisy somewhat confused about her home address, it is Stan who (recognising Daisy in the street) directs Lee and Tim to the nursing home where she lives. 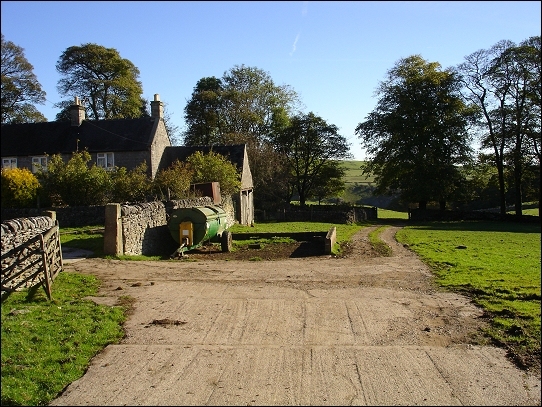 AN IMPROMPTU LATE autumn trip to the hillsides above the village of Ilam (location for both Fenton's half-way house and Ellen and Ron's farm in Mad Dog) in October 2010 coincided with some bright and clear weather - ideal for some updated location photography. 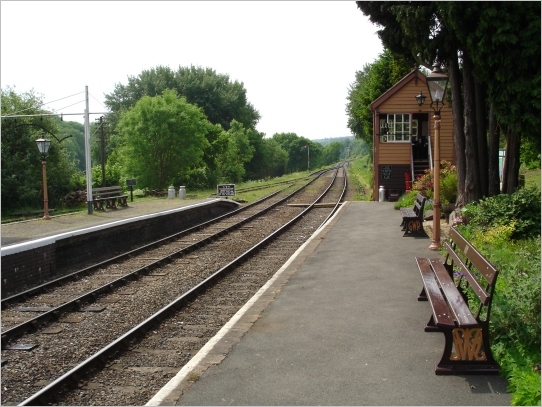 A VISIT TO the Hampton Loade train station on the Severn Valley Railway (the location for the closing sequences of Mad Dog) in June 2010 provided the ideal opportunity for some new photos of this memorable location, in some bright early summer weather. ROBERT PUGH, WHO plays the role of train fireman Terry in Mad Dog, appeared in the 22 May 2010 episode of Doctor Who entitled 'The Hungry Earth', the eighth installment of the current series. Pugh plays the role of the mining geologist Tony Mack who is supervising a deep-core drilling operation in Wales, which inadvertently threatens a race of aliens living far below the Earth's surface. This episode (the first of a two-parter) was followed by concluding installment 'Cold Blood' (broadcast on 29 May 2010) in which Pugh also appeared. 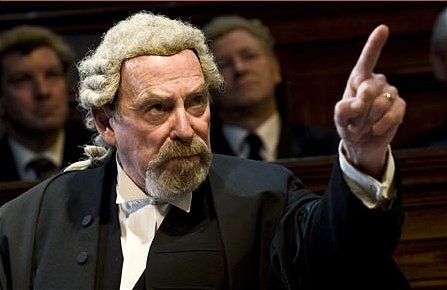 GREGORY JAMESON OF the Entertainment Focus web site has published a new online interview with Denis Lill, on tour with the Agatha Christie Theatre Company's production of Witness for the Prosecution. In the interview, Lill discusses his current on-stage role as Sir Wilfred Robarts QC in Witness, alongside many different aspects of his extensive theatre and TV career. I've been back to Callow Hill [the main filming location for series two], which is just above Monmouth quite a few times. It took me a long time to really let go of the place because it sort of changed my life in a funny sort of way. We were up there for about six months filming, and I met and made friends, and it's also a very charismatic place. If there is such a thing as special places in the world, there was something about that place that was very special for me, and I just loved it so much that I kept gravitating back towards it whenever I was in the area I'd pop in to Callow and say hello, and how's everything going? I haven't been there for some time now, so I guess I kind of exorcised that particular one (laughs)! Many thanks to Gregory Jameson for permission to quote from his interview. ACTOR, STUNTMAN AND stunt co-ordinator Max Faulkner (Phil, Mad Dog) passed away recently. Born in 1931, Faulkner's long TV career began in the late 1950s with appearances in The Adventures of Sir Lancelot (1957), The Buccaneers (1957) and Ivanhoe (1958). Faulkner's genre credentials were extensive, often combining acting roles with stunt work, including appearances in The Prisoner (1968), Space 1999 (1976), Blake's 7 (1980) and The Day of the Triffids (1981). Faulkner also worked on the big-screen in movies including Bond films From Russia with Love (1963) and Goldeneye (1995), war movies I was Monty's double (1958) and Where Eagles Dare (1968), and fantasty films Willow (1988) and Nightbreed (1990). Faulkner worked alongside Doctors Jon Pertwee and Tom Baker, featuring in The Ambassadors of Death (1970), The Monster of Peladon (1974), Planet of the Spiders (1974) - with Pertwee; and Genesis of the Daleks (1975), The Android Invasion (1975), The Hand of Fear (1976, as fight arranger), and The Invasion of Time (1978) - with Baker. Faulkner recalled his time working on Mad Dog in a letter to Lynne Sweetman in October 1996. More of his acting credits can be reviewed in the Acting Credits section of the site. A REPEAT BROADCAST of a ghostly 1973 radio play featuring Morris Perry (Fenton, Mad Dog) was heard on BBC 7 in April. Perry appears in an installment of the Vincent Price-narrated The Price of Fear entitled Come as You Are as a husband in an unhappy marriage who meets a grisly end when his efforts to do away with his disloyal wife go badly wrong. Come as You Are was broadcast on 4 April 2010, and made available on the BBC iPlayer service for a week following transmission. 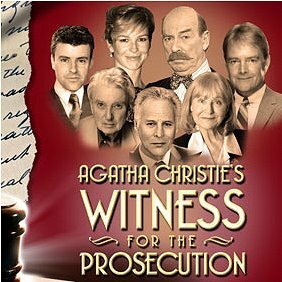 DENIS LILL IS on tour with the latest Agatha Christie Theatre Company's production of Witness for the Prosecution. The tour began in Shrewsbury in January 2010, before travelling to Barnstable, Cardiff, and now moves on on to Blackpool (The Grand, March 8-13), Rhyl (Pavilion, 5-10 April), Southend-on-Sea (The Palace, 24-29 May), and Cambridge (Arts Theatre, 31 May-5 June). The tour then continues at venues across the country until September 2010. For more information on the tour dates, see the updated listings on The Stage site. More information on the production, and the company, can be found on the Agatha Christie Ltd site, where tickets for all shows can be purchased. Lill co-stars in the role of leading barrister Sir Wilfred Robarts. Alongside Lill, the cast includes: Honeysuckle Weeks (from the BAFTA award-winning Foyle's War), Ben Nealon (Soldier, Soldier), and Robert Duncan (Drop the Dead Donkey), with Peter Byrne (Dixon of Dock Green), Jennifer Wilson (The Brothers) and 1960's teen idol Mark Wynter. 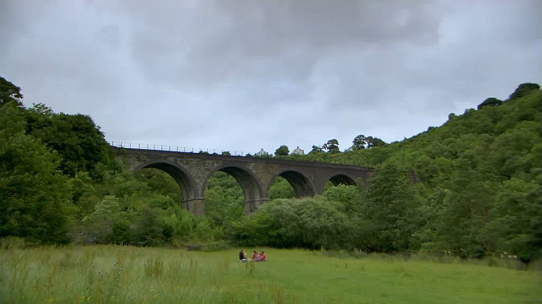 THE MONSAL VIADUCT - one of several iconic locations used in the filming of Mad Dog - appears in the 2010 big-budget horror movie The Wolfman. 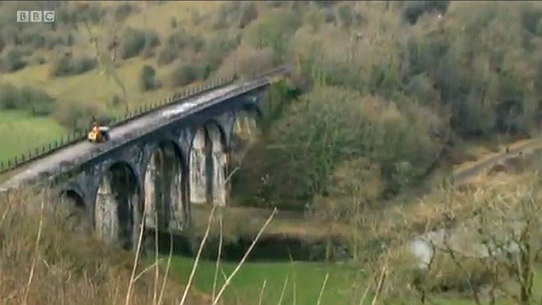 Footage showing a computer-generated steam train crossing the viaduct (see the screengrab below) features in the film's official trailer. The film also features extensive sequences shot at and in the grounds of the nearby Chatsworth House. 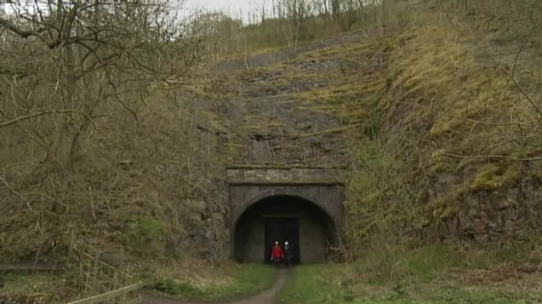 AMBITIOUS PLANS TO re-open the closed railway tunnel sections of the Monsal Trail (including the Monsal Head tunnel seen in Mad Dog) as a recreational attraction for walkers, cyclists and horse riders have been approved by the Derbyshire Peak District. 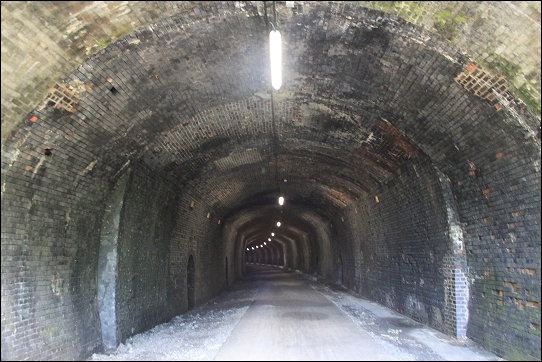 All of the rail tunnels were sealed following the closure of the line after the Beeching cuts, and in recent years walkers and cyclists have had to divert from the main trail to complete the journey between Buxton and Bakewell. 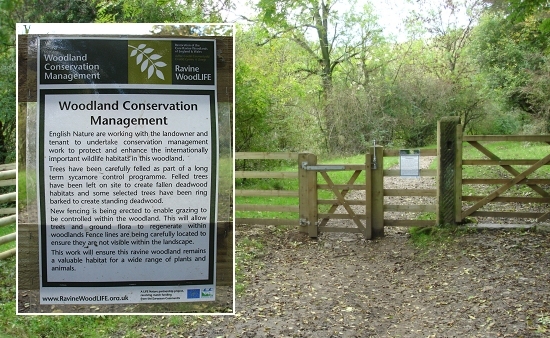 Work on the £3.785m project will commence in early 2010. The Sheffield Star reports that: "The Department of Transport is contributing £1m to the project and Cycling UK has promised a donation of £1.25m." Richard Campen, the National Park Director of Operations says of the project: "It will create both a spectacular cycling route and a realistic alternative to the car, enabling more people to make healthy choices for themselves and for the environment... It will also benefit local tourism businesses with rail and cycle-based travel packages." "The national park is a huge asset and this project gives us a real opportunity to develop a generation of cyclists who cycle regularly, with all the health benefits that brings... There are lots of potential opportunities to extend the proposed scheme by working with public transport providers and local authorities in neighbouring urban areas. For example, it would be great if a visitor or commuter could catch a train in Manchester, get off in Buxton and then ride straight down a cycle trail into the national park." 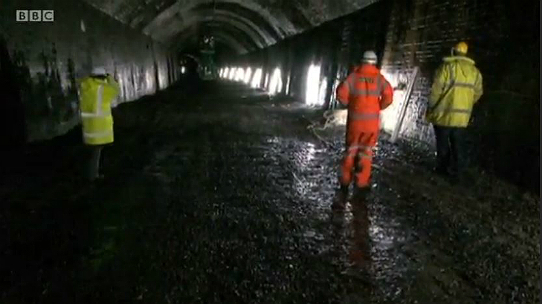 Footage of some of the closed sections of the line can be seen on the BBC News site. Progess on this exciting and long-awaited project will be followed closely on the Survivors: Mad Dog site. MAD DOG SCRIPTWRITER Don Shaw has penned a new book recounting the events surrounding football manager Brian Clough's six year tenure at Derby County in the late 1960s and early 1970s - and in particular on the events surrounding Clough's contentious resignation from the club in October 1973. 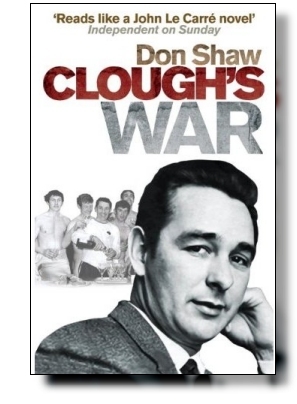 Shaw explained to the Derby Telegraph what led him to research and write Clough's War: "I have been a Derby County supporter since I was 10. I saw them win the Midlands Cup in 1944... and was always a fan from then on. I was a season ticket holder when Clough resigned and I couldn't believe it and had to do something about it… I first came across Brian just after we started the protest movement, a few days after he resigned from Derby County… I got people together and we all met at the Crest Hotel, in Littleover. Clough and I worked together to get him back because he regretted leaving Derby bitterly." Shaw hopes his book will eclipse the controversial version of Clough presented in book and film versions of the The Damned Utd, which focused on his tenure at Leeds United. The work "angered former players, fans and members of the Clough family." Shaw recounts that he was approached by Clough's widow Barbara Clough to "voice her protest at the dark depiction of her husband in the [Damned Utd] novel." Writing in The Independent, reviewer Simon Redfern says of Shaw's alternative take on the Clough phenomenon: "He is avowedly partisan… but he isn't blind to Clough's faults, observing acutely that his pride was as much a source of weakness as of strength… Shaw dramatises the increasingly bitter confrontations between Clough and Sam Longson, Derby's dour chairman, very well - an account of secret meetings, complete with passwords, reads like a John le Carré novel." Shaw is hopeful that his book may be optioned for film adaptation. "I know a top director who was going to direct The Damned Utd", says Shaw, "and didn't because he didn't think the script was up to what he expected and instead is interested in doing a film of my book". Clough's War was published in hardback on 7 May 2009 and will be released in paperback on 3 June 2010. The book is available from Amazon and most online and highstreet booksellers. 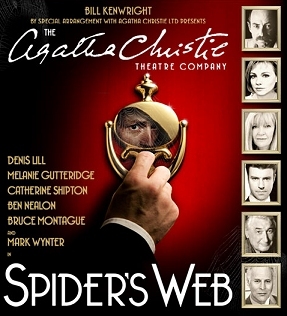 ACTOR DENIS LILL (Charles Vaughan) is touring once again with The Agatha Christie Theatre Company, this time in a production of Spider's Web. The tour began at the Palace Theatre in Southend on 9 March 2009 and continues at venues across the country, concluding on 7 November 2009 at the Churchill theatre in Bromley. 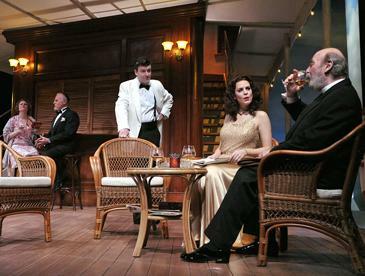 During the 2008 tour of And Then There Were None (see below), conflicting work commitments saw Lill leave the production part-way through the tour, but Lill will remain with this production for the entire of the tour. Full details of the tour dates are available through The Stage online listings service. More details about the production can be found on the Agatha Christie Ltd site. 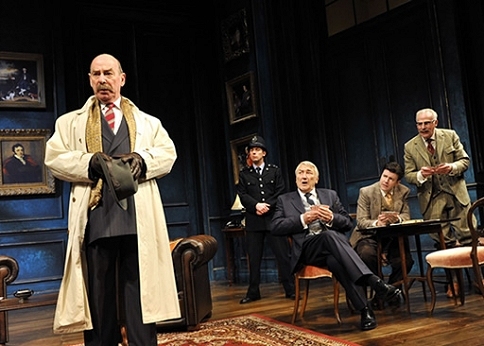 Publicity for the tour explains: "Presented by the official Agatha Christie Theatre Company, the all-star cast features Denis Lill from The Royal, Survivors, and Outside Edge, Melanie Gutteridge best known for her role as PC Emma Keane in The Bill. Catherine Shipton famous for her long-standing and highly acclaimed role as Duffy in the hit BBC hospital drama Casualty, Soldier Soldier star Ben Nealon, Bruce Montague renowned for his role in Butterflies, and Mark Wynter who has delighted audiences with his all round talents from pop career to TV, film and stage." THE PRINCIPAL MAD DOG location - Monsal Dale, in the Derbyshire Peak - features in the first episode of a new BBC4 series Railway Walks first broadcast on Thursday 2 October 2008. 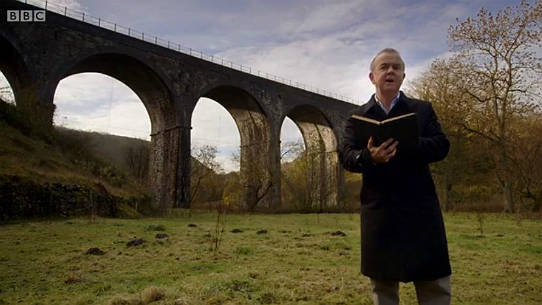 Presented by Julia Bradbury, the series takes the viewer through a series of walks, following the routes of long disused railway lines in both rural and urban locations across Britain. 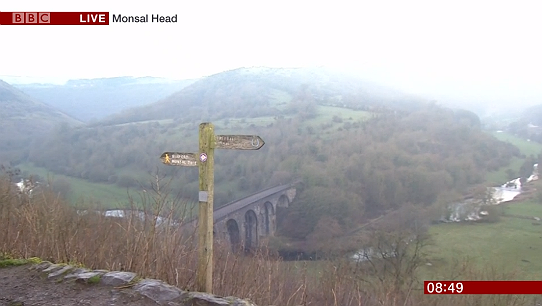 Episode one, 'The Peak Express', follows a walk along the Monsal trail, starting in the village of Bakewell, before passing through the Monsal valley and out along Miller's Dale. 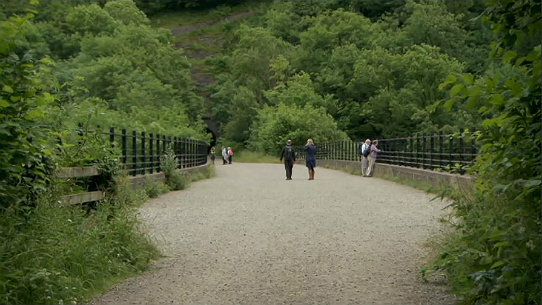 The episode includes a range of different footage of the Monsal viaduct, and includes sequences shot inside the sealed-off 'Headstone tunnel' (from which one of the dog packs appears in Mad Dog). 'The Peak Express' was repeated several times on BBC4, and the programme was also made available on the BBC's iPlayer service. 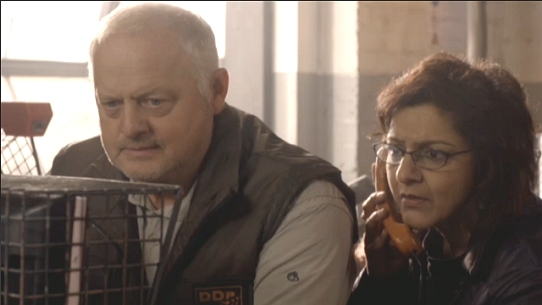 Phil – a former air-traffic controller and the group’s self-appointed leader – is on a mission not to grow old. He believes his combination of obsessive physical exercise and the latest health supplements will hold back time. His constant sparring partner is Freddy – a shambolic slacker who prefers to stroll and smell the flowers. Freddy's eternal mission is to find the meaning of life. Until he does, he takes consolation in outmanoeurvring the vulgar, aspirational world around hims with his very own art of 'onedownmanship'. Thankfully they have Don to calm the waters. All Don asks for in return is some peace, tranquility and perhaps a decent pint when they reach their destination. What all three share is a withering view of the modern world – a place resounding to the noise of traffic jams and mobile phones. And as they enjoy the peace of their weekly walks, weathering all that the elements and local characters can throw at them, they waste no time in setting that world to rights. Shaw's novel can be purchased from good bookshops, Breedon Books, and the usual online retailers including Amazon. 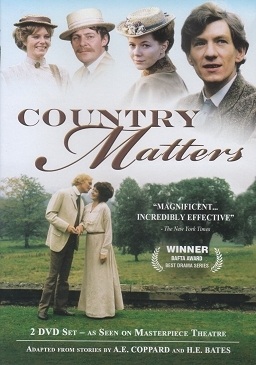 THE 1972 GRANADA TV drama The Watercress Girl, an installment of the BAFTA-award winning Country Matters series, has been released as part of a two-disc DVD set. 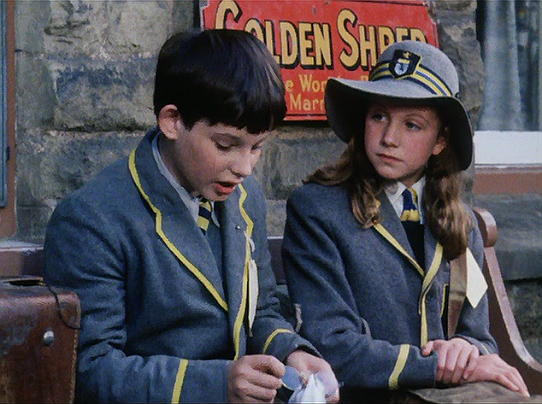 Shot on 16mm film entirely on location, The Watercress Girl utilises many of the same Monsal Dale settings that were used five years laters in the recording of Mad Dog - including the Monsal Viaduct, the rocky outcrop and the surroundings of Netherdale Farm. The release, on the Koch Vision DVD label (licensed by Granada International) features eight of thirteeen episodes from the two series of Country Matters. Disc one contains four series one episodes: Craven Arms, The Mill, The Sullen Sisters and The Watercress Girl. Disc two comprises four series two episodes: The Little Farm, The Black Dog, The Higgler and The Ring of Truth. The release therefore omits the series one episodes Crippled Broom and Breeze Anstey and the series two episodes The Simple Life, An Aspidistra in Babylon, and The Four Beauties. The transfer to DVD does not appear to have included any clean-up of the source video or film stock, so picture and sound quality remain serviceable rather than first-rate. The release is currently only available in Region 1 format (the North American default) - so in Europe (where Region 2 is the default) the discs can only be played on a Region 1 compatible (or multi-region) DVD player. For more on The Watercress Girl, including the Monsal Dale locations used in the programme, see here. Find more details on the release from the Koch Vision site here. 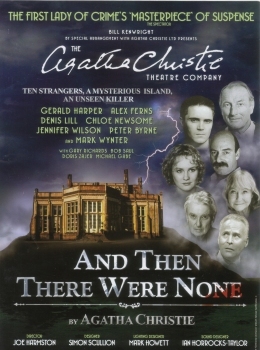 ACTOR DENIS LILL (Charles Vaughan) is currently on tour as a member of the Agatha Christie Theatre Company in a production of the classic whodunnit And Then There Were None. Lill appears in the role of private investigator, and former Scotland Yard detective, William Blore. The tour began in February 2008 and continues until the autumn (with a summer break). After a trip to the Theatre Royal in Nottingham in April, the Survivors: Mad Dog editor can confirm that this is a first-class production, brimming with energy and a great deal of confident panache. Set and stage design is excellent, and lighting and sound design are both superb - together greatly enriching the atmosphere of isolation, claustrophobia and mounting terror. The cast is uniformly strong, and - as would be expected - Lill equits himself with both skill and relish. For fans of genre, cult and classic TV more generally, the cast is also notable for the inclusion of Gerald Harper (as Sir Lawrence Wargrave) from Adam Adamant Lives and Hadleigh; Peter Byrne (as General John Mackenzie) from Blake's 7 and Dixon of Dock Green; and Jennifer Wilson (as Emily Brent) from The Brothers. The tour continues at locations across the UK until September 2008. For all of the dates on the tour, see The Stage's complete run sheet here. 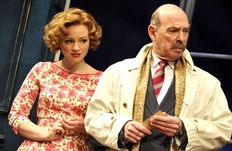 Update, July 2008: Denis Lill leaves the production after its run in Leeds. Lill's last performance will be on Saturday July 12. 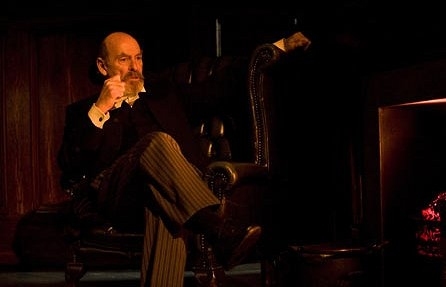 When the play returns for its September run, the role of William Blore will be taken by Derren Nesbitt, see more details here. REPAIRS TO THE line damage caused to the Severn Valley Railway by flooding in June and July 2007 (see below) has now been completed. 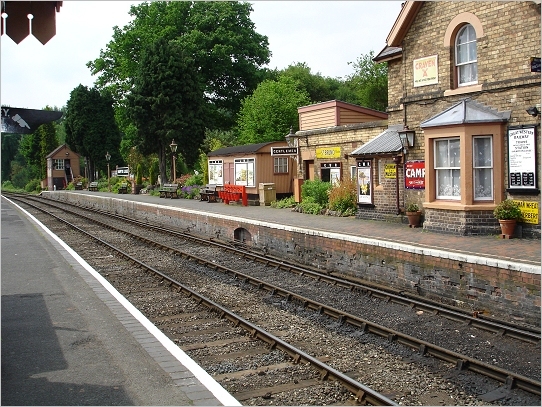 On 21 March 2008, the line between Bridgnorth and Kidderminster fully re-opened, meaning that the Mad Dog (Hampton Loade), Bridgehead (Highley) and Law of the Jungle (Country Park Halt) Survivors filming locations are again accessible by rail. Details of the 2008 Severn Valley Railway timetable can be found here. Donations to the appeal to raise funds to cover the substantial repair costs can still be made online here. 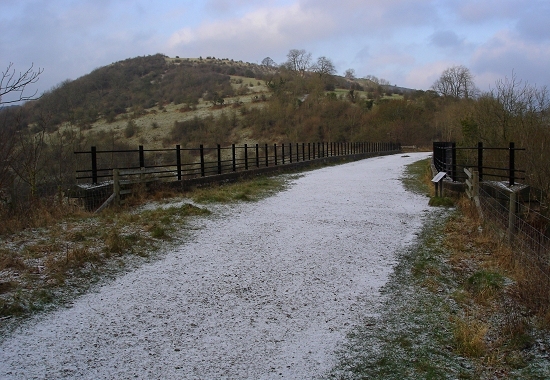 THE FIRST SNOWFALL of 2008, on the morning of 3 January, brought a light covering of snow to the Monsal valley Mad Dog locations, replicating very closely the recording conditions experienced by the BBC crew back in January 1977. Unsurprisingly (in bitterly-cold, early-morning, post-Xmas holiday conditions) the valley was all-but unpopulated by visitors, allowing some very effective and evocative photography to be shot. 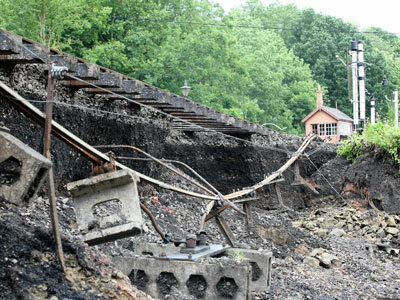 THE APPALLING WEATHER experienced across the UK in June and July 2007 has caused significant and widespread damage to the rail line between Kidderminster and Bridgnorth on the Severn Valley Steam railway — the location used to record the closing sequences of Mad Dog (and featured in the episodes Bridgehead and Law of the Jungle). The SVR web site reports that, along the line: "in no fewer than forty-five separate locations the ground has slipped or moved." This slippage is the inevitable result of such rentless rainfall which saturates the ground beneath the track. The BBC reported that: "the equivalent of two weeks rain fell along the Severn Valley in the space of just thirty minutes in mid June, and so it continued – day after day after day!" The result of the downpour is that: "drainage channels have been blocked by debris, and silt and mud have covered the tracks completely in places." Flood damage caused to the line near to Highley Station on the Severn Valley Railway, in June-July 2007. More seriously, the SVR reports that: "in at least ten locations, the damage is such that external expertise and heavy plant and equipment will be required to enable our full service to recommence. At these places, we currently estimate that repair work will take many weeks. Repairs to this damage, including an additional major problem with land above the Railway at Northwood, are now estimated to require funds in excess of £2.5 million!" "These problems are also delaying the opening of The Engine House, the new Visitor & Education Centre at Highley." Remedial work is now underway, but the only section of the line operating in August was between Kidderminster and Bewdley, with the remainder of the line closed to rail traffic until further notice. This means that Hampton Loade station (the principal Mad Dog location on the line) is currently unreachable by train. The Severn Valley Railway has launched a Flood Damage Appeal to help raise finds to bring the line fully back into service. Learn more about the repair programme and donate to the appeal fund here. 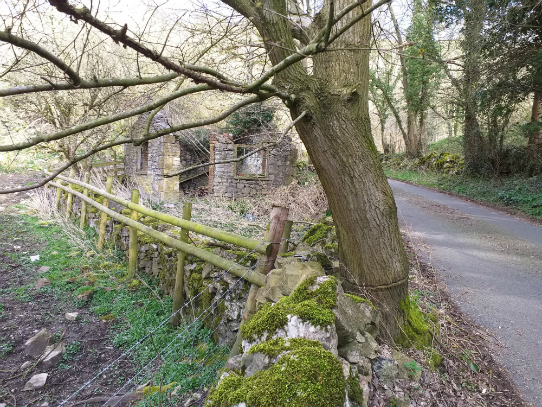 A NEW WOODLAND Conservation Management area has recently been established in Monsal Dale by English Heritage. 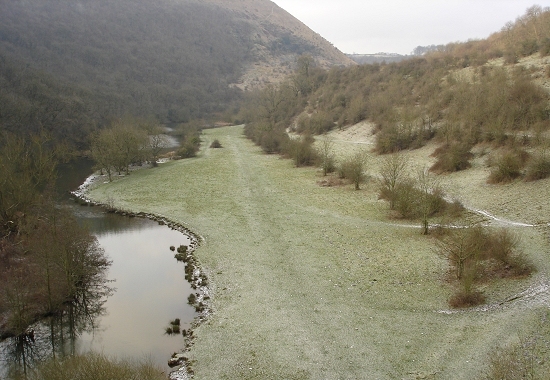 As the Ravine WoodLIFE site explains, Monsal Dale has already been "designated a Site of Special Scientific Interest (SSSI)", as well as a "Special Area of Conservation (SAC) (1) and now forms part of a Europe wide network of over 14,000 high quality conservation sites called Natura 2000." This new conservation status is intended to "protect and enhance the internationally important wildlife habitats" throughout the valley. One indication of the change is that the approach to the Monsal weir area is now marked by new fencing (with gated pedestrian access). 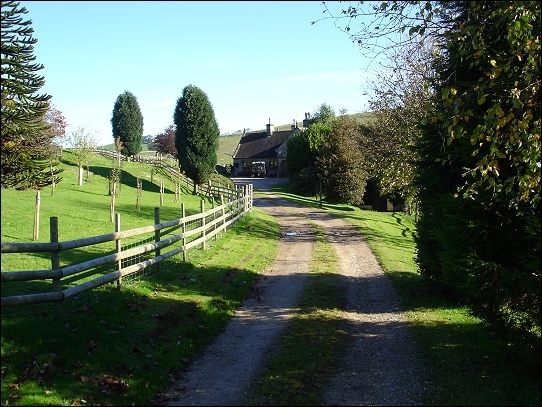 The fencing is intended to limit grazing by the livestock which previously roamed freely throughout the valley and "allow trees and ground flora to regenerate". 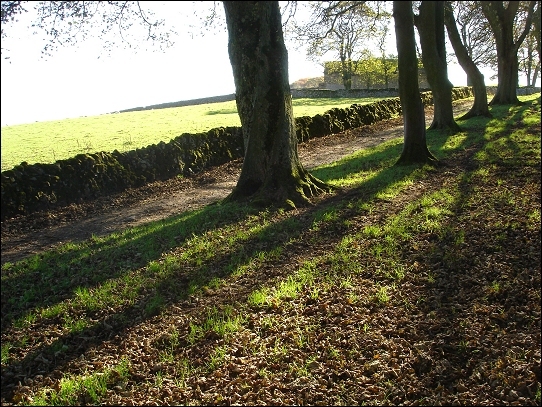 Other drystone walls in the valley are also to be repaired to control livestock movement. In addition: "hawthorn scrub over 60 acres of ground will be managed to enhance its wildlife value, with small glades being cleared through the scrub to provide ideal conditions for plants and butterflies." To further encourage the resurgence of wildlife, a number of sycamore trees have either been felled and left to rot to create groundlevel "deadwood" habitats, or "ring barked" to create "standing deadwood." This will "benefit insect species such as the longhorn beetle together with bird species like the treecreeper and bat species including the noctule bat". As well as enhancing the local ecology of the valley, the project will also serve to further protect the landscape of the area. See more information on the project on the Ravine WoodLIFE site. 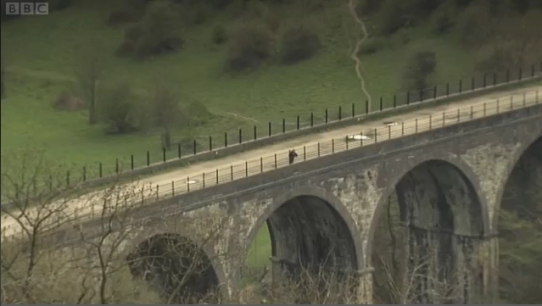 THE MONSAL DALE viaduct — perhaps the most iconic of the Derbyshire locations used for the filming of Mad Dog — has been recognised as one of the Seven Man Made Wonders of the East Midlands, and has featured in a new BBC documentary of the same name. The winners of the competition were decided by public vote on an initial shortlist compiled by BBC researchers. BBC regions across the UK hosted similar votes, with the winning entries in each of the nine regions featuring in parallel half-hour documentaries, all of which were broadcast at 18.15 on Sunday 12 February 2006. Seven Man Made Wonders of the East Midlands was presented by Rajesh Mirchandani, and included segments recorded at Lincoln Cathedral, at Foxton Locks in Leicestershire, on the Fosse Way, at Chatsworth House, in the Lincolnshire village of Stamford, in the caves beneath Nottingham city centre — and in the Monsal valley. 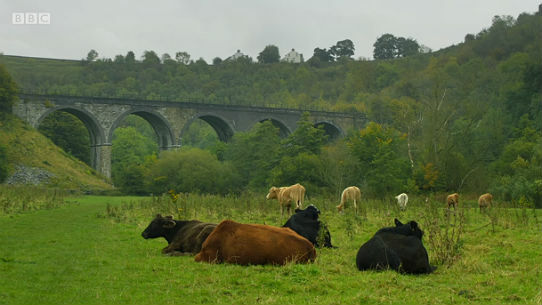 The Monsal segment featured an appearance by former Labour Party deputy leader Roy Hattersley, who was keen to celebrate the architectural triumph that the viaduct represented at the time of its construction. 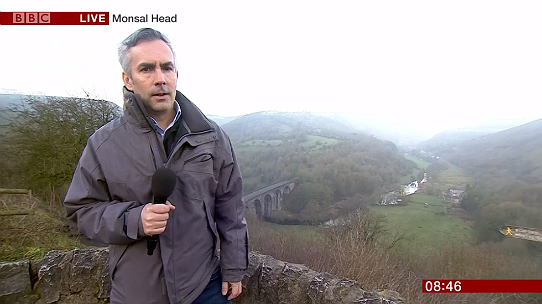 It also included interviews with a life-long train-enthusiast who, with the help of his father, had photographed and filmed trains using the rail line through Monsal over many years. 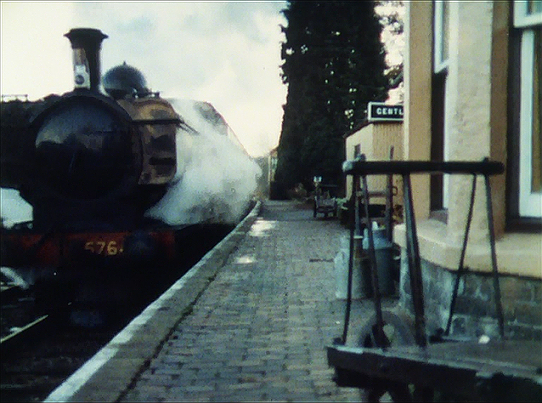 Several of their evocative home cine-movies of locomotives using the line were featured. Also briefly interviewed were three retired train drivers, one of whom spoke of the pleasure of driving trains along the line between Bakewell and Buxton. 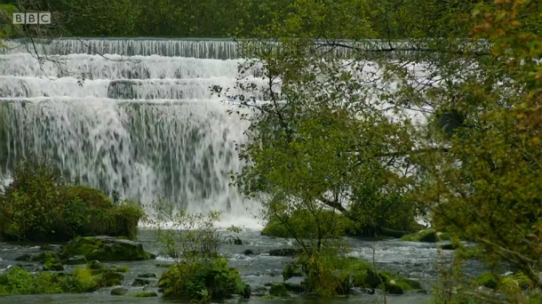 Filming for the documentary took place in autumn 2005 — with rain showers clearly visible in some of the Monsal footage. More information about the Seven Man Made Wonders of the East Midlands can be found on the BBC web site. Many thanks to Adrian Hulme for advance notice of the broadcast of this programme. 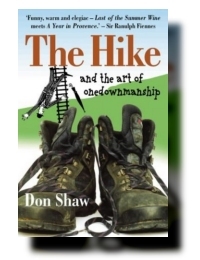 SINCE IT WAS originally published by Tideswell Press in September 2004, Mad Dog script writer Don Shaw's first novel The Hike has grown into a mainstream commercial and critical success. First optioned by Random House in the summer of 2005, the work has since been re-issued under the publishing company's Ebury Press brand, and is about to be re-released for a second time with a redesigned cover (see right). Don Shaw confirmed in Febuary 2006 that: "The Hike continues to do well — but will perform better still, I hope, when the mass paperback comes out on 6 April." Work on the sequel is continuing. When Shaw was initially looking for a publisher for The Hike he hired the Publishing Services company to help him self-publish the book (under the Tideswell Press imprint) as a means to secure the interest of a major publisher in a first-time novel he was finding it hard to win a contract for. The success of Shaw's strategy has been documented in a free-to-download two-page feature article in Writer's Forum magazine (.pdf format). Having now enjoyed the opportunity of seeing his series three Survivors episodes on DVD again (following DD Home Entertainment's release of series three in November 2005), Shaw notes: "My daughter, Jane, now 37, is delighted to show her friends her post-holocaust lifestyle as a seven year old dirty-nosed little girl!" THE FIRST NOVEL by Mad Dog scriptwriter Don Shaw, originally published by the small Derbyshire-based publishers Tideswell Press in 2004, is to be repackaged and republished this August by Random House – the world's largest publishing house. ** More material from this interview with Don Shaw appears in the new Survivors book 'The End of the World? ', published by Telos Publishing in Autumn 2005, and in the free to download publication 'The Making of Mad Dog', published in April 2006. SURVIVORS' SCRIPTWRITER DON Shaw — who wrote the classic episodes Greater Love, Face of the Tiger, Mad Dog and Reunion — has just published his first novel, entitled The Hike. Shaw has been making a number of public appearances to promote the work — including a talk at the Bakewell Arts Festival on 11 August (close to Monsal Dale) and a book signing session at Derby Cathedral Bookshop on 25 September. 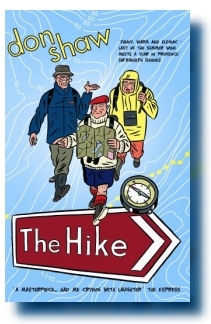 The Hike is published by Tideswell Press and retails in paperback for £9.99. 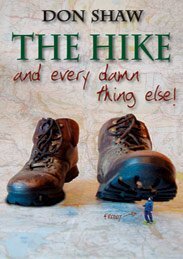 "The first book, by the creator of Dangerfield, The Hike combines three characters set in the mould of One Foot in the Grave (ie tetchy, opionionated, proud to be over sixty-five!) with lyric descriptions of the Peak District countryside and customs. Its gentle humour pervades even the darkest moments yet it is unsentimental in its depiction of rural life — as lived by inhabitants, not weekenders. Bill Bryson let loose on the Peak District? Gervaise Phinn?" The book can be purchased, or ordered, from all highstreets bookstores, or bought on-line from the usual e-retailers. 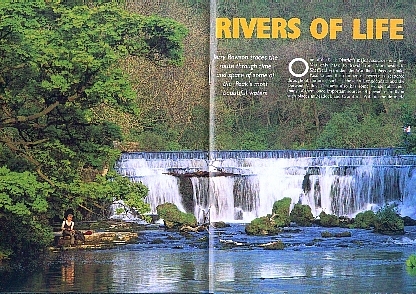 THE SEPTEMBER 2004 issue of Peak District Magazine features full colour shots of the Monsal weir (see below) and of Thorpe Cloud (the hilltop above the Dovedale Gorge seen in the background of Fenton's half-way house). This will be the final issue of the magazine, which ceases publication after a run of more than seven years. 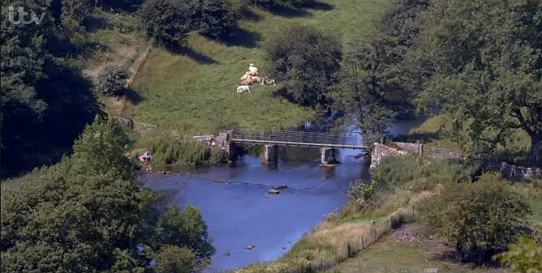 The shot is taken from the far riverbank near Netherdale Farm, and features the footbridge also seen in the episode as Charles flees from the farm outbuilding after he is discovered hiding there. 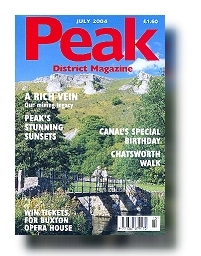 Peak District Magazine costs £1.60, and is available from larger newsagents across the Midlands area. The Making of Mad Dog — coming soon! Series three on DVD? — It could be 2005!